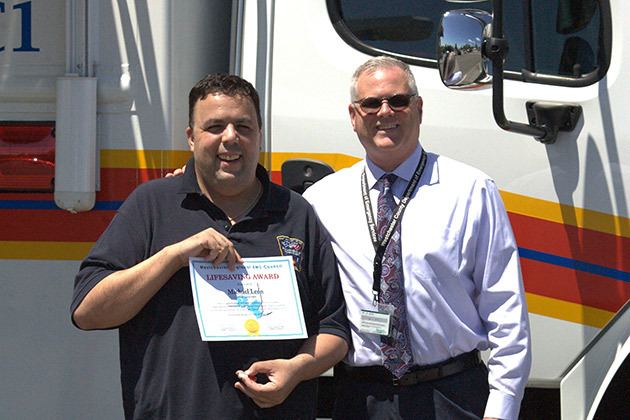 Communications Operator Michael Leon was awarded a Lifesaving Award at the Westchester Regional EMS Council’s 45th Annual EMS Award Ceremony on May 17, 2018. Emergency Services Commissioner John M. Cullen presented Communications Operator Leon with the award in recognition for providing pre-arrival medical instructions to a person in cardiac arrest. His efforts in providing medical instructions over the phone contributed to the saving a life. Communication Operators assigned to the Emergency Communications Center (ECC) at the Department of Emergency Services are trained to calm distressed callers, obtain critical dispatch information and, if needed, provide medical instructions prior to the arrival of an ambulance. Please join us in congratulating Communications Operator Michael Leon for his performance in providing the citizens of Westchester with exceptional service. What is the criteria for winning the Lifesaving Award? Patient was completely resuscitated, that is, his/her physical and mental capabilities were significantly restored to the level that existed prior to the illness/injury. Documentation from the treating hospital must be attached to the nomination verifying this information.